Our environment provides a ripe opportunity to be salt and light in military society. Salt tastes saltiest on a saltless plate. The darker the room the brighter the light. As our culture continues drifting further into a post-Christian neo-pagan worldview, Christ-followers may be tempted to spiritual panic attacks. Especially for those of us striving to integrate faith and biblical worldview into our military profession, how can we remain faithful to our call when policies and programs appear to oppose higher principles and priorities? During anxious, despairing moments we must remind ourselves we live in a fallen world. We will always experience tension between what the Lord requires and what the world in its systems expects of us. Yet, we should also remember this eternal truth: God remains on the throne. History is “His story.” And in the end, Jesus triumphs over our morally upside-down world. Our environment provides a tremendous opportunity to be salt and light in military society. Salt tastes saltiest on a saltless plate. The darker the room the brighter the light. We need anchor points to snap link us to our certain Lord in uncertain times: never forget you are called to serve like a Daniel, and you’re called to love and live like Jesus in a lost world. You are—and will always be—called. Serving in the military reminds us of God’s sovereignty. Just as the Israelites in the wilderness stopped to set up camp and later rucked up and moved out via the pillar of smoke by day and the pillar of fire at night, that 8×11 piece of paper called orders to the next duty station also serves as sovereign God’s assignment to you. As a Christian you can know without a doubt that the assignment officer was acting as God’s mouthpiece when those orders were cut. God has already prepositioned the people you will live, work, and deploy with—a strategic placement as His ambassador—to make an impact, possibly beyond this life and military career. Even if living out your calling is demanding and overwhelming, remember God equips His called ones. As attributed to the great missionary Hudson Taylor, “Where God leads, He feeds; and where He guides, He provides.” Our responsibility is to find the cache points of God’s grace and resource ourselves for the demands of our calling. Serve like a Daniel. As God’s people in the military struggle with policies running counter to a biblical worldview, it’s helpful to understand and practice the example of Daniel in the Old Testament, who lived in the morally corrupt, pagan society of Babylon, which had conquered and enslaved Israel. 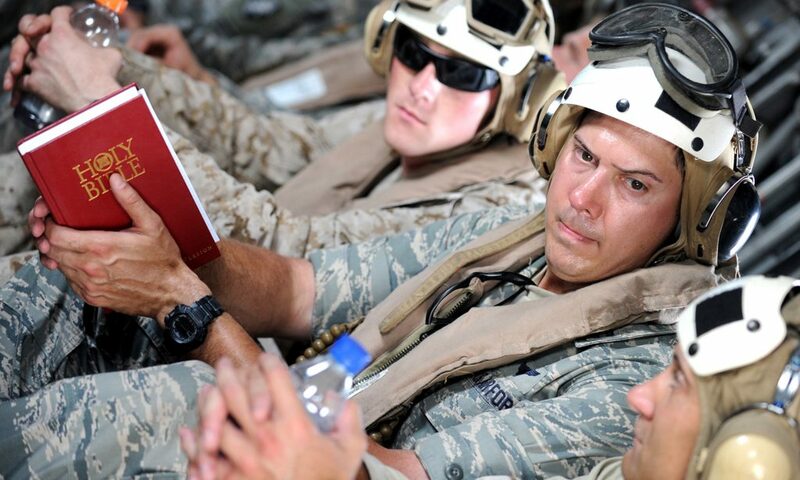 Daniel’s actions and reactions provide helpful Tactics Techniques and Procedures (TTPs) for living out our faith in the military. Daniel had a clear sense of his lines in the sand. Remaining prayed-up and under the authority of God, he willingly assumed risk when confronted with the unexpected challenges of living in a godless society. Daniel stood faithfully for his God-centered convictions, yet communicated them in a humble, gentle spirit. God used the proximity of Daniel’s calling before the pagan king and his court and his spiritually courageous life to humble the king and manifest God’s greatness to Babylon. We each must prayerfully determine our lines in the sand, based on our understanding of God’s Word and the conviction of the Holy Spirit. When faced with the choice of honoring God, are we willing to assume risk by doing what’s right? When the meeting engagement comes, remember all you have at that moment is what you have. A spiritually full magazine increases the likelihood of doing what is right and honoring to the Lord. We must learn to live and love like Jesus in an uncertain world. We must love those we interface with whose lifestyles and world views are contrary to ours. When we encounter those broken by their sin or others’ sins, we must engage them with the love and mercy of Jesus. Sin is sin in God’s eyes. He does not grade on a curve. His solution for sinners separated from Him is Jesus Christ’s life, work, and resurrection. The same grace that brought us to Christ brings all who call upon His name, regardless of the manifestation of their lost lives and lifestyle choices. In thinking about Jesus and who He drew to Himself, it was the untouchables of society. Those most sincerely lost wanted to be with Him—not the religious folks. Who would the “untouchables” of our day say they felt the most judged and rejected by? I’d say Christians, and the church in general. If we are called to live and love like Jesus there ought to be a magnetic quality to our faith which draws the lost and opens opportunity to communicate where our hope and salvation lies. When Jesus met the woman caught in the act of adultery, He extended grace to her while not compromising the truth of Scripture, “Neither do I condemn you; go, and from now on sin no more” (John 8:11). Wouldn’t it be wonderful if those most lost would be as drawn to us as they are drawn to Jesus? It’s said that discouragement is the occupational hazard of the Christian ministry. I would broaden that by substituting “life” for “ministry.” To remain inspired and encouraged we must strongly believe we follow a certain God in an uncertain world. Never doubt your calling to your unit, post, or ship by the Master Logistician who will supply all your needs. Maintain your strength in God for those Daniel-sized challenges coming your way by resting in His outcome. Live like Jesus, clothed in Him to live out that calling in a morally ambiguous, often haywire world. Practice these anchor points and you will remain snap linked into the Rock of Ages. Q&A: A trio of chaplains shares insights into serving in the military. Read more here. Marc, who is moving from his Army’s Training and Doctrine Command post at Fort Eustis, VA, and is in a third term on OCF Council, will serve as garrison chaplain at Joint Base Lewis McCord, WA. Marc is a twenty-four-year Army chaplain with multiple deployments to Iraq, Afghanistan and Kuwait. He and his wife, Christa, have four children.